Bangles form one of the basic accessories that women wear all around the world. Whether married or unmarried, bangles are one of those accessories that can jazz up any outfit. There are numerous types of bangles available in the market. One can buy them in different shapes, sizes, and designs. Although bangles are worn all over the world, they hold a special significance in Hinduism. While the men in India wear a single bangle also known as kara, on the other hand, women wear a lot of bangles after marriage, also known as Choora. Married women wear bangles as a form of their Shringar or adornment. Bangles are considered important after marriage as it is associated with matrimony. It is almost equivalent to wearing the wedding ring in Western cultures. Bangles have been a part of the Indian culture since 2000 B.C. or even earlier as they have been found in archaeological sites in India. But why do Married Women Wear Bangles? Bangles form the biggest part of the ornaments for the bride’s Shringar which is considered mandatory. They are a symbol of matrimony. This is why married women wear bangles of metal, glass, wax, gold, and silver at all times after they get married as they are a sign of the long life of their husband. They are said to bring good fortune and prosperity. In Hindu tradition, the breaking of the bridal glass or lac bangles is considered very inauspicious.In some cultures, the girl can’t keep her hands empty even after getting engaged. The bride-to-be has to wear bangles, especially on festival days before the marriage. Every culture in India has its own customs regarding bangles and its types as well as colors. In South India, gold is considered extremely auspicious. The brides wear green colored glass bangles along with gold ones, as green signifies fertility and prosperity. Bengali brides wear a conch shell bangle and a red coral bangle, which is called shakha and pola in Bengali. Along with this, the mother-in-laws gift their daughter-in-laws a gold plated iron bangle when she first enters her new household. In Rajasthan and Gujarat, the brides wear similar ivory bangles or choora as well. In Gujarati culture, the bride’s maternal uncle gives her the choora in a ceremony called mameru, as well as a bridal silk saree, usually with a red border. In Maharashtra, the bridal choora is quite different. The Maharashtrian brides wear green glass bangles usually in odd numbers. The green bangles signify creativity and fertility. They wear these along with gold bangles called patlya and kadas called tode. The gold bangles are gifted by the groom’s family. 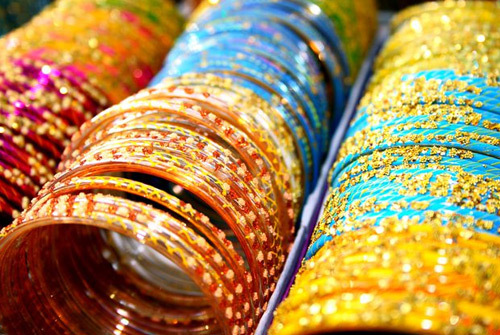 In Indian culture, different color of the bangles, traditionally, have different meanings. Red signifies energy and prosperity, green as mentioned above denotes good luck and fertility. The yellow bangles are meant for happiness, while white is for new beginnings. Orange bangles are for success. Gold bangles are a symbol of fortune and prosperity while silver bangles denote strength. 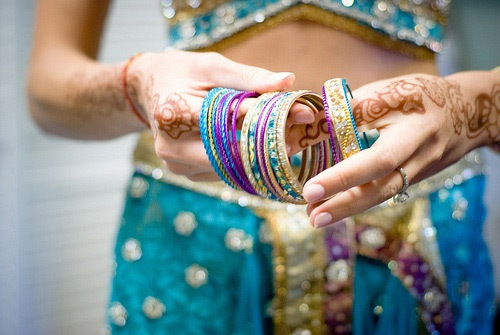 Whatever the material, color, or type bangles are crucial ornaments for the married woman in Hindu cultures. Next articleHawan – A Myth Or A Necessity?